After a trial is over, am I finished or am I still on call? After receipt of a summons, how long will I be required to call in or check online for instructions? After receipt of the summons, when should I return the enclosed Jury Information form and Confidential Juror questionnaire? Are jurors given lunch breaks? Can I "apply" to be a juror? Can I be recalled for service in another month, if I did not actually report for jury duty during the month for which I was summonsed? Can my employer fire me because I am serving as a federal juror? How do I request to be excused if jury service will result in undue hardship or extreme inconvenience? How much time will it take until I know if I'm selected? I live a long distance from the courthouse. Do I need to report? If I am selected, what are the hours I would be expected to spend at the courthouse? If I served on jury duty in Circuit Court, do I have to serve in Federal Court? If I work, do I still have to serve as a juror? Is my employer obligated to pay regular salary even on jury duty days? May I bring a friend or members of my family? May I leave the Jury Assembly Room or Courtroom? What kinds of cases are handled in Federal Court? Which law protects me in my employment while, or after, serving as a juror? Why do I have to call or check eJuror so often? Why do we spend so much time sitting around before the actual selection process starts? Yes. Your jury service for this term has ended. You are no longer required to report or call for instructions. 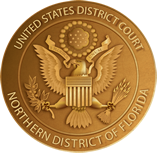 We appreciate your service as a juror for the United States District Court, Northern District of Florida. Jurors are summoned to serve for a month for petit jury service, or twelve to eighteen months for grand jury service. During the month summoned to serve, you must call the Automated Jury Information System (AJIS), at 1(866) 560-4756, after 4:30 PM ET each Friday, starting with the first possible reporting date on your summons. Do NOT report without first calling the recorded message to determine if you need to report for federal jury duty. Follow the reporting instructions for the duration of your term. You will be given a specific time and day to report for jury selection. You can also check your current status and reporting instructions online with Ejuror. The Jury Information form should be returned immediately in the self addressed envelope provided. You should bring the Confidential Juror Questionnaire with you when you report for jury service. Yes. There are several restaurants within walking distance of each of the courthouses. Jurors are also welcome to bring their own lunch. No. Per the Plan for the Random Selection of Grand and Petit Jurors, jurors in the Northern District of Florida are selected at random from the certified list of registered voters from Florida's Secretary of State. One must be a registered voter and reside for one year within the Northern District of Florida. Yes. In rare instances, if additional qualified jurors are needed for a jury trial the court may recall qualified jurors from other months who did not actually report for jury duty. Shall be subject to a civil penalty of not more than $5,000.00 for each violation as to each employee. Your family may call the Clerk's Office at the courthouse where you are serving. Instructions and criteria for requesting a hardship excuse can be found on the jury duty information page. Jury selection time varies. Generally, you should know within two to three hours after selection commences in the courtroom whether you are selected to serve or not. Per the Plan for the Random Selection of Grand and Petit Jurors, your name was randomly selected from the certified list of registered voters obtained by the court from Florida's Secretary of State, and you completed and returned to the court a Juror Questionnaire which indicated that in accordance with court rules and federal statutes you qualified to serve as a juror. Yes. If the distance from your home to the courthouse is at least 60 miles or more one-way and commuting each day would be impracticable, you may come the night before you are to appear. Authorization for overnight stays must be obtained in advance from the Jury Administrator. More information on overnight stays and juror payment can be found on the Jury Duty Information page. Court is usually held between the hours of 9:00 a.m. and 5:00 p.m. Yes. You are still eligible for federal jury service. Yes. A great majority of jurors work. In fact, employers must provide employees with time to serve as a juror, and cannot charge said time to either vacation or sick leave. Although most private companies do pay employees serving as federal jurors their regular salaries, they are not obligated to do so. No. It is important for you to report promptly for jury duty. If an emergency arises, you should notify the deputy clerk of the circumstances, when you report. If the emergency is such that you absolutely cannot report for jury service, you should call 850-521-3705 and notify the jury administrator. Generally, the court is open to the public. However, you cannot talk to anyone about the trial while you are serving on jury duty and it may be best to leave friends, family, and children at home while you serve on jury duty. No family members are allowed in the jury assembly room. If you need to leave the Jury Assembly Room, please notify the jury clerk. Once you are in the courtroom, you may leave only when the judge takes a break or excuses the jury from the courtroom. Smoking is prohibited within the courthouse. Smoking is permitted outside the building only. Jurors who fail to report as directed can be ordered to appear before the court to show cause for his/her failure to comply with the summons. Any person who fails to appear pursuant to such order or who fails to show good cause for noncompliance with the summons under the Jury Selection Act (18 U.S.C. 1866(g)) may be fined not more than $1,000, imprisoned not more than three days, ordered to perform community service, or any combination thereof. Federal court jurisdiction is limited to certain types of cases listed in the U.S. Constitution. For the most part, federal court jurisdictions only hear cases in which the United States is a party, cases involving violations of the Constitution or federal law, crimes on federal land, and bankruptcy cases. Federal courts also hear cases based on state law that involve parties from different states. While federal courts handle fewer cases than most state courts, the cases heard tend to be of great importance and of great interest to the press and the public. Jurors should bring the completed Confidential Juror Questionnaire, and the upper section of the summons. Please note that due to heightened security at all federal courthouses, a government-issued photo ID is required to enter the building. In addition, please note that jurors may not bring weapons of any kind or electronic devices of any kind into the courthouse, including but not limited to: cell phones, smart phones, radios, PDA's, recording devices, portable computers, cameras and portable music players. React with hostility to the news of the employee's jury duty, withdraw customary assistance to the employee; criticize, reprimand or discharge the employee without cause, but rather for reasons related to the jury service. ( Hill v. Winn- Dixie Stores Inc., 934 F 2d 1518 (11th Cir 1991)). Pressure an employee to submit a materially misleading statement to the court in an attempt to avoid jury duty. (U.S.A. ex rel Perkins v. Sara Lee Corp., 839 F. Supp. 393 (W.D.Va.1993), vacating on other grounds, 852 F Supp1321 (1994) (stipulation of Dismissal vacating judgment)). Coerce an employee into requesting postponement of the jury duty until the employee has earned sufficient vacation time for it. (Jones v. Marriott Corp., 609 F Supp. 577 (D.D.C. 1985)). Cut back the work hours, change work assignments or conditions and/or discharge an employee serving on jury duty because his absences upset the employers work schedule. (In Re Webb, 586 F. Subb. 1480 (N.D.Ohio 1984)). Obligating jurors to work overtime after jury service or assigning jurors to work on their personal days from jury duty. (U.S. A. ex rel Madonia v. Coral Springs Partnership Ltd., 731 F. Supp. 1054, 1056 (S.D. Fla. 1990)). We draw groups of jurors for service each month. The court works diligently to schedule trials and summons jurors to the courthouse only when needed. It is important to call the jury information line or check eJuror after 5 p.m. each Friday, because the recording and eJuror will have the most current jury reporting information available. This time is used by the judge and the attorneys to discuss unexpected events that must be communicated outside the presence of the jury. This may seem like time wasted, but it is important for the judge and the parties to be able to resolve these issues before the jurors report to the courtroom. The U.S. District Court conducts trials in both civil and criminal cases. There is no way to know what type of case a juror might be assigned to until the day they report for jury service.